Enter into HP Latex Sign & Display with this compact printer. Print in anything and in high quality and with eco standards with the new Water-based HP Latex 315. Also optimized speed, minimized damage risk and instant delivery with the new automatic X-axis cutter. Building on years of third-generation the best-selling sign and display printers ever are back with all-new technology assets. The new HP Latex 315 Printer delivers high image quality, productivity and durability, as well as environmental benefits and industry certifications, all now synonymous with water-based HP Latex Ink Technology. Print beyond paper - expand to self- adhesive vinyl, backlit, wall paper, and more - up to 1.37 m (54in). Eliminate waiting time - prints come out completely dry and ready for finishing and delivery. Produce high quality at speed - 12 m2 (129 ft2 )/hr indoor quality with HP OMAS and HP Latex Optimizer. Minimized damage risk - scratch resistance is comparable to hard-solvent inks on SAV and PVC banner. 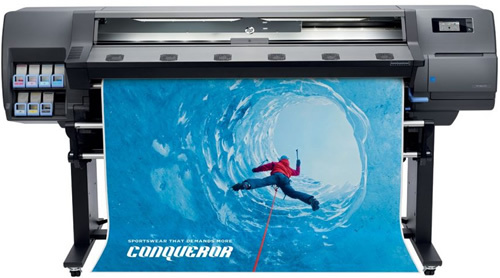 The HP Latex 315 Printer features a number of significant innovations that take you beyond the limits of eco-solvent printing, creating new opportunities to expand your business.